Application Templates: Integration with Application Templates Community site has been introduced; now one can work with application templates (publish, download, provide feedback etc) directly from IPHost Network Monitor GUI client (see “Settings > Community” section). 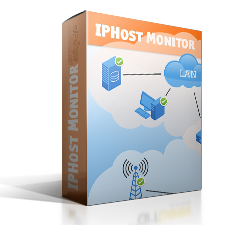 Installation: IPHost Network Monitor main program and Remote Network Agent can now be installed in unattended (batch) mode. That can be convenient if IPHost should be deployed in virtual machines. Monitoring Service: “Script over SSH” action functionality has been restored. Previously this action established SSH connection but did not run the script. Alerting: separate recovery actions can now be specified for escalated problem state (i.e., when monitor stays in problem state considerable time. Dependency on agent’s connected state can now be added to monitors provided by the agent. That can help to reduce amount of alerts when agent gets disconnected for some reason. This release was tested and confirmed to support alerting via popular groupware and messaging platforms: Slack, HipChat, Microsoft Teams, and Telegram. Follow instructions in corresponding KB articles to configure alerts for these platforms. Several bugs have been fixed. You can find more information about the release in Release Notes.